Following in the footsteps of their collaborations with such luminaries as Whitesnake and Slash, our friends at Classic Rock magazine have announced their latest Fan Pack, dedicated to Chickenfoot. The Chickenfoot Fan Pack will not only contain a copy of their eagerly-anticipated second album, Chickenfoot III, but also a 132-page magazine devoted to the band. In addition, if you pre-order a copy of the Fan Pack from Myfavouritemagazines.co.uk before 27 September then you'll also be the lucky recipient of a limited edition Chickenfoot bottle opener/keyring. Fans who buy the Chickenfoot Fan Pack get two exclusive bonus tracks that won't appear on the record store version of the album. The Fan Pack magazine is 100 percent Chickenfoot-approved and contains exclusive interviews with Sammy Hagar, Joe Satriani, Michael Anthony and Chad Smith talking about their new album, plus their respective careers as part of some of the biggest bands in rock. Chickenfoot III is the follow-up to the band's acclaimed (and certified gold-selling) 2009 self-titled debut. The Fan Pack also tells the story of the making of the band's new video, how they created a 3D album cover, an overview of their solo careers and the story behind each and every song on the new record. The magazine is also packed with rare shots of the band, an exclusive muso section as well as a Guitar Pick Pack, 3D glasses and a 3D CD digital book pack with postcards. 11.Down The Drain (Live in Phoenix) - Exclusive to the Chickenfoot Fan Pack, no other digital or physical release will include this track. 12. Oh Yeah! (Live in Phoenix) - Not available on any other physical release. 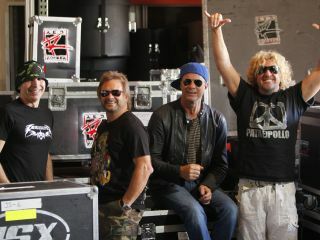 The Chickenfoot Fan Pack is due for UK release on 27 September.